You need to have a good site for growing the flowers. The soil must be suitable for the growth of the flower. You can grow flowers in the parallel path to your property line and you can make use of this flower to make your hairs look beautiful, decorate your home. You must choose an ideal site for the flower bed because your soil must be good enough and at the same time you must have a vision from your home. Because seeing flowers will make your mind relax and make you feel happy. This article will give you some needed ideas for choosing a site for your flower bed. 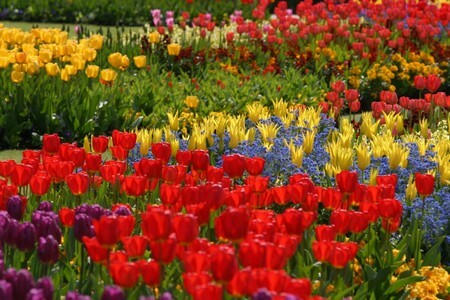 First thing is the sunlight, choose an apt site where the flower bed has good sunlight for its photosynthesis reaction. Some plants need sunlight directly and some need only its shades, take a note of these plants. In springtime, the sun must rise up early, choose a site like this. These sites are available in northern hemisphere, there you have cold climate, this increases yield of the flower and at the same time the flowers will grow earlier in the year. Try to choose a site near your location, and easily reachable one so that you can take care of your flower bed. You must have an adequate path to your home and the flower bed. If not having make the way as soon as possible. Drainage facility is the most needed thing. Try to construct good drainage facility for your flower bed. The rain water if get accumulated in the flower bed means, the flower plant can damage and even could die, so make appropriate way to drain the water. This helps you a lot during any floods. If the place has vegetation already means clear them, because this will occupy the place meant for the flower beds and the flowers don’t get the entire richness of the soil. Avoid site that is underneath a tree because this will not give the sunlight and at the same time the roots of the flowers doesn’t allow the flower bed to grow. Try to keep the flower bed to be visible from your street; which attracts the person who goes by the roadside. This also gives an enhanced beauty to your home. Place a bench near your flower bed, so that you can spend the leisure time there watching the flowers. The nice fragrance of the flower makes your breath nice and some flowers make your health better. Your home could look like a picnic spot.